Indoor and Outdoor Climbing – Are there rules? Why? Really? When it comes to hard and fast rules in climbing, there aren’t actually too many of them. And in a way, that’s why we love it: The freedom to tackle a route or problem how we want and bask in the achievement at the top. This is a guest post by Chris Thomson, a UK climber and writer. As with most hobbies, sports and activities, there are certain little pieces of nuanced courtesy that if observed by all climbers would gaurantee less landowner fights and crag closings. These aren’t set in stone rules, and sometimes people may take them a little too seriously, but they generally help keep everyone safe, happy and the area clean and tidy for the next group of climbers. And most importantly, these tips all work to keep access open to our favorite crags. Here are just a handful of climbing examples for both gym and crag that are helpful to keep in mind to make sure all climbers don’t get a bad rap due to simple misunderstandings. Just like it’s unsafe to walk under a ladder, walking under someone who’s climbing is asking for trouble – not only is it obviously going to hurt if they fall on you, but just being there could prove distracting and cause them to lose concentration. Quite simply, if someone falls on you then it’s your fault. I see this problem a lot in gyms. Even seasoned climbers will dip under a rope between the belayer and climber as it’s the fastest route across. Little kids are the worst culprits. It’s distracting for the climber and even moreso for the belayer. Falling when climbing presents enough of a danger as it is, even with crash pads, so if someone’s gone and left a rucksack full of kit in a fall zone, the potential for injury increases. Usually it’s by accident, but taking care to spot all the potential landings goes a long way in keeping injury-free. Even something as small as landing on a water bottle could end up breaking an ankle. So even if it isn’t yours, feel free to move it out of the way, for safety’s sake. And don’t be afraid to give a fellow climber a friendly warning if they’re dumping their stuff in fall zones. Respecting the environment is the biggest key to ensuring long-term access to climbing areas. Take note of of the surrounding vegetation – this will make it easier to decide where to place you kit and minimize any disturbance. The same goes for wildlife – in 2015, a couple of climbing routes were closed in Scotland because of pine martens, so always treat the local fauna and flora with respect. And if a route is closed, then that means closed! 99% of climbers will comply but you’ll always get that minority who think the rules don’t apply to them. Or, they don’t understand the actual risk to the plants/animals, if the closure seems excessive to them. This is one case where it’s definitely within everyone’s best interests to obey the rules. Not only for your own safety and those of plants/animals, but also for the public image of all climbers. As with any kind of outdoor pursuit, the goal is always to leave the area as close to its original condition as you can. The most obvious thing that needs to be packed out is any rubbish left lying around from food or product packaging, but it’s also important to think about the wall and rock too. If you find a loose piece of rock on the route (a really wobbly flake or a detached rock), if you can, remove it for others safety. If it’s not safe to remove, this is one time where it’s great to mark the route, with a chalky X. If you’re not comfortable with either or the above, that’s fine. Instead, try to contact the local climbing coalition to see if they can do anything to improve the safety of the route. Likewise, in the gym, if you happen to notice a loose hold, or are able to rotate a hold, tell an employee so it can be fixed. If at all possible, leave the area in a better condition than when you found it! If some inconsiderate climbers have left their trash behind, you could be a good samaritan and clear it away. Outside crags in particular rely on self-cleaning and we’ve all stumbled across the ugly scene of unaware climbers who’ve left their trash behind. This post has more advice on looking after the outdoors from organizations such as the John Muir Trust and the Countryside Restoration Trust. One of the best things about climbing is the peace and quiet it affords us, a break away from our busy lives. And for that reason, it’s polite to keep the noise down. Even a tune-pumping gym can become our own little oasis, but now playing music is getting more common when out at the crag. Although some climbings enjoy turning on the tunes, that is still far from the norm. The volume or style of music is unlikely suit everyone’s tastes, including the landowners, nearby residents and others enjoying the area. As shown in this Climbing article, landowners can shut down a crag at pretty much a moment’s notice, and rubbing them the wrong way could ruin it for everyone. That’s not to say it’s imperative to have silence at all times. If there are other climbers around, it’s fine to ask if they mind having music playing, and also to be respectful if they ask to turn it down or off completely. Unfortunately, it’s hard to judge the distance that music travels, so without some serious reconnaissance, you won’t be able to tell if you’re tunes are contained to your small area. Editor’s note: Last week while climbing at Wild Iris in Wyoming, a group of climbers from down the crag were blasting tunes. Who knows what the real volume was, but those tunes sure traveled along the surrounding walls to the parking lot and neighboring camping areas. We encountered multiple climbing teams who were totally uncomfortable with the broken solitude but were equally uncomfortable with taking the time to find the source and confronting them. It can often feel like a lose-lose situation for climbers who do not want to party at the crag. Headphones are an option we’ve seen employed along with a careful balance of volume to still hear instructions or warnings from others. Personal volume levels should also be taken into consideration. Keeping the shouting down to a minimum (when not directly climbing/safety related) is helpful. Not letting any frustrations boil over is easier said than done, but most climbers agree that throwing a tantrum rarely solves the real problem. This can also come into play for “encouragement.” Screaming at climbers to “JUST GO FOR IT” and “STOP BEING A BABY” can make neighboring climbers feel very awkward and uncomfortable as well. To many climbers, spraying beta is also considered noise. Spraying beta is offering unsolicited advice on a particular problem. For many climbers, a big part of the ideal challenge is figuring out how to solve a problem, by themselves. Not everybody appreciates unsolicited advice, no matter how friendly it’s spoken. If you do want to offer advice, make sure the other person is ready to hear it. Generally chatting about interesting routes is social talk and expected. But it may not actually be helpful to hear about the exact details of the route including the bomber jug or perfect crimp, especially when somebody is on the wall focused on their own method. As well as spraying beta, there are various other considerations to make towards other climbers, such as when and where not to climb. Like if someone is already on the wall, whether in the gym or on the crag, they have right of way. Try and work out their climbing route – you may think they’re climbing in one direction and start off, only to find you get in their way when they go a different direction. And watch out to see where a line may extend to on popular routes. Some climbers like to give a little space and you might accidentally be cutting in front. How long you’re spending on the wall is also something to be wary of, particularly if there is a line of climbers waiting to climb the same route. You have the right to take your time since you got there first, but if there is a huge struggle and progress is extremely limited, this is a red flag. It might be time to have a break, regroup or even try something a little simpler for the moment. Likewise, leaving a top rope on a wall all day and then disappearing elsewhere is extremely frustrating for others who might come along. Sometimes it may feel like nobody else is around, and it’d be fine to leave a rope and go climb around the corner. But, that rope will be spied from farther away and can thwart and frustrate climbers who wanted to do that same route, without you even knowing it. The rule of thumb is to take your gear along with you as you move around the area. Climbing etiquette starts even before you actually get to the crag – are you parked properly? Parking can be a real issue, especially at popular climbing spots where space is at a premium, and if too many people are inconsiderate, blocking access, then don’t be too surprised if access is revoked. Editors note: When we climbed at City of Rocks in Idaho, we went to a popular area where the small number of official paved parking spots were taken. We parked on the side, in an area we felt was free of plants and would cause no harm. We came back from the climb to find a note on our car, that any non-paved parking spot is not OK. The Ranger’s note kindly wished in the future that we would be more courteous of the land. It was definitely a wake-up call. Even our parking on the dirt could increase the amount of erosion or prevent plants from growing back. Lesson learned, the disrespectful way. The Access Fund has a ton of great tips on reducing impact and preserving access. Below is a more humorous attempt at reframing the parking dilemma. So this is a little different depending if you’re male or female. Most males are stoked when ladies hit on them at the gym or the crag (females are usually savvy enough to look for a wedding ring, spouse or headphones). Part of this reason is the guy:girl ratio. Guys have a much smaller chance of getting hit on than women. Since it’s not as common, it’s usually more welcome. On the other hand, many ladies have horror stories of “the stalker guy at the gym” who get’s too close or the “creeper spotter” whose spots toe the line of sexual harassment. It can sometimes feel like there are a line of guys just waiting to take their turn to hit on the good-lookin’ ladies. This tongue and cheek post by Kristin Bjornsen highlights the perils of being hit on at the gym and what to do about it. If you see a potential romantic partner at the gym, take it slow as you learn how dedicated they are to their climbing routine. Some people don’t want to be bothered at the gym, under any circumstance. Maybe a wave or nod of recognition that your schedules seem to match and after a multiple sessions a compliment on their climbing. Just don’t jump into “need a spot? !” or spewing beta. Any dogs should be well trained and not cause a disturbance to the land or the peacefulness of the crag. 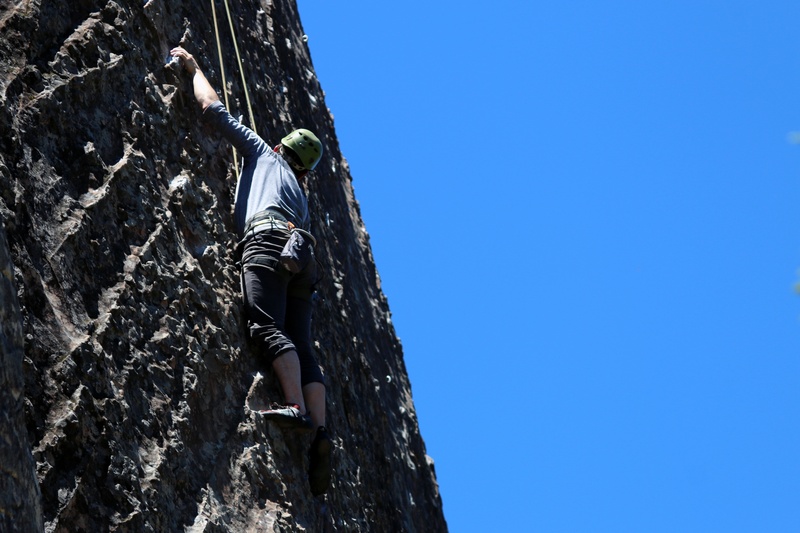 A “crag dog in training” can still be really frustrating and frightening to other climbers. It may sound harsh, but the same goes with children! Climbing walls aren’t a babysitting service. And, your tot, who is surely adorable, should not be distracting to other climbers. Interestingly, more climbers are dog-friendly than children-friendly. Before moving a pad, make sure no-one else is using it. For similar reasons for not spraying beta, erasing your tick marks is important. Chalking up before touching the holds can stop them from getting greasy. But it’s also kind to brush the holds after you’ve used them so the chalk doesn’t build-up. All climbing etiquette boils down to: thinking about others. Being courteous and introspective to your impact on the land and your fellow neighbors (whether they are climbers, landowners, hikers or sightseers). Your pleasantness increases the ability for climbers to have a positive rapport with the locals and landowners. This good energy will keep our climbing crags open long into the future. Have we missed any essential pieces of climbing etiquette? Let us know in the comments! Chris Thomson is a freelance writer for outdoor specialist Winfields, as well as a keen wildlife photographer and marathon runner. He is looking forward to getting back in the bouldering game after having a rather nasty dislocated shoulder.